Because of its simplicity, all the ingredients must be very fresh. Needless to say, minced pork, shrimp needs to be as fresh as possible but I find it especially pertinent for the tau kwa and would never buy those in sealed packaging from supermarkets if I am making Pong Tauhu. A bit of effort to make a trip to the local pasar pagi usually guarantees freshness in the ingredients and making friends with the hawker who sells tau kwa, beansprouts also helps, as they would tell you if that day’s ware is indeed fresh or not. I have a quirky habit when I want to buy tau kwa especially for Pong Tauhu, i.e. I would bring the slab of firm bean curd close to my nose and take a brief whiff. A piece of fresh bean curd should exude the lovely aroma of soya beans and void of the sourish odour we sometimes get from stale pieces. The texture should also be fairly soft and bouncy, despite being firm soya bean curd as stale ones tend to be slightly more dehydrated causing them to harden too much and look very dry and yellow. As long as one uses the freshest ingredients possible, half the work is already done. 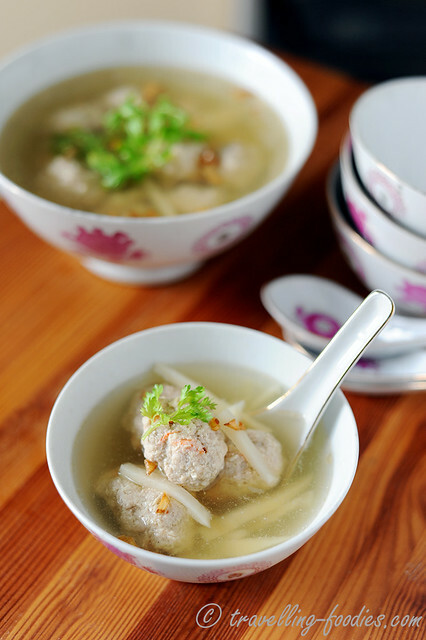 As this is a very common soup made at home, the ratio of prawn, minced pork and taukwa varies from household to household, depending on individual liking. 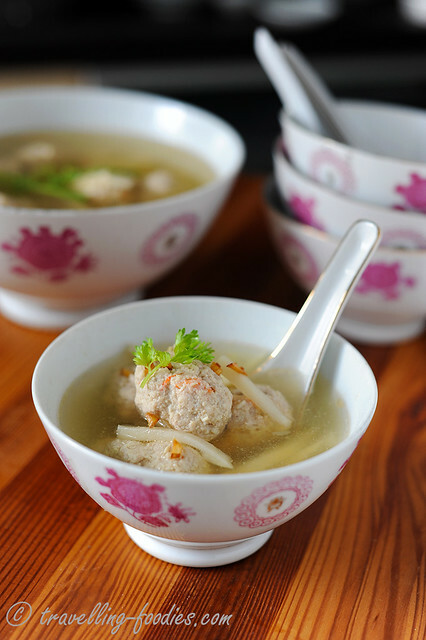 The texture of the meatballs also vary as some prefer the prawns thoroughly mashed into a paste for really smooth meatballs while others like them in chunks for more bite. Older folks also tend to believe that the visual presence of the prawns should be felt and one should be able to make out the prawns added to the dish, a “theory” which is also perpetuated in Ngoh Hiang (five spice meat rolls). I like to leave them slightly chunky with bits of pink and orange peeking out from the otherwise drab looking pork balls. So what I have provided here is basically just a guideline for the ingredients. Adjust it according to the preference of your family members as it is after all their sense of satisfaction after enjoying the soup that makes all the effort worthwhile. Chop prawns into small pieces. Mince or mash if smoother meatballs are preferred or leave them in chunks for more bite. Cut the piece of taukwa into small chunks and press the pieces through a sieve to finely process them. Otherwise, a potato masher works well too. 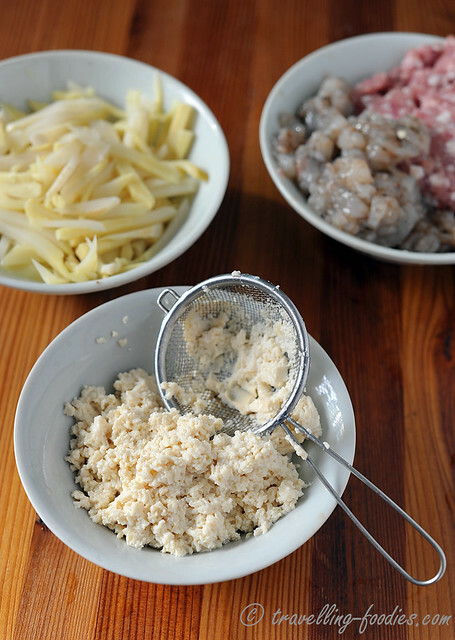 Place minced pork, mashed taukwa, prawns and the remaining meatball ingredients into a mixing bowl and mix thoroughly. I use my potato masher for that and it works really well. Set aside to marinate for 15-20 min. Meanwhile prepare the soup base by pouring water into a deep saucepot and bringing to a boil. If using, add pork ribs to prepare pork stock, otherwise, water is just fine. Chop bamboo shoot into thin strips and blanch them using a separate pot of water for 3-5 min. Drain and set aside. Discard bamboo shoot boiling water. To a saucepan, add oil and saute coarsely chopped garlic until they are crisp and slightly brown. Do not overfry the garlic or they would taste bitter. Dish up the pieces of fried garlic and set aside for later use. Using the same oil, sauté taucheo until fragrant. Add 1-2 ladles of pork stock or boiling water into the pot and proceed to pour the mixture back into the remaining stock in the pot. Add blanched bamboo shoots and bring to a boil. Lower the flame to barely simmering and roll the marinated ingredients into balls, appro. 20g each. Drop them gently into the soup. Do not disturb the meatballs at this point. When the meatballs firm up and turn pale, cover with lid and bring the flame up to medium low and simmer for 10-15 min. Skim off any scum floating on the surface of the soup. Taste the soup and adjust accordingly with more salt and pepper. 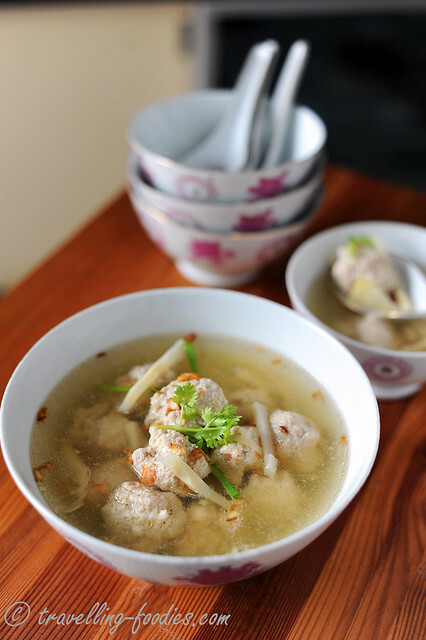 Dish soup into a bowl and garnish with fried garlic, chopped spring onions and leaflets of chinese coriander. 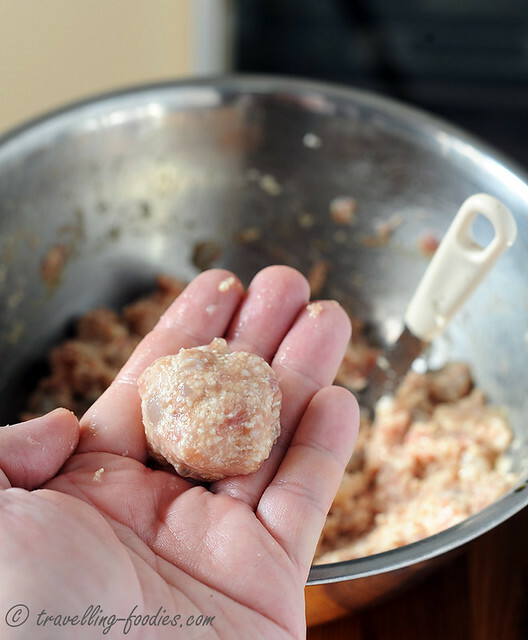 (1) When rolling the marinated minced pork mixture into meatballs, wet the palms slightly to help in the shaping process. (2) The soup base must be barely simmering when the meatballs are added. Too much turbulence would cause the raw meatballs to disintegrate. 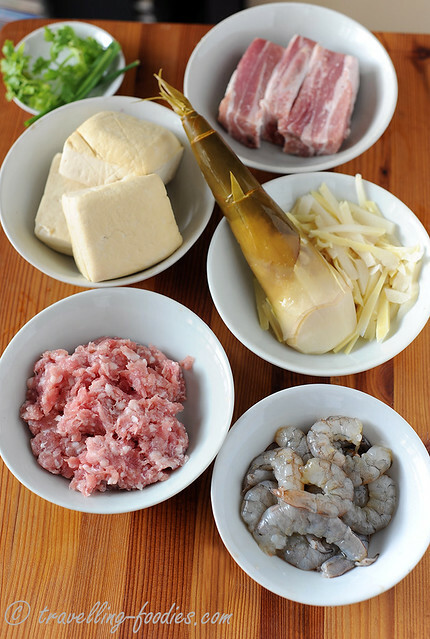 (3) In the past, the pork and prawn mixture is repeatedly slapped against the mixing bowl or “flatten” with the side of a cleaver against the chopping board to work out the “gel” from the meats that would help bind the ingredients together. This is quite laborious so a tablespoon or non-gluten starch like corn flour, tapioca flour or potato starch is now added to do the same job but practically hassle-free. (4) For me, the beauty in the flavours carried by this dish comes from the chopped garlic and chinese coriander. So please do not omit them! This entry was posted on September 17, 2013 by Alan (travellingfoodies). It was filed under Food, Simple Eats and was tagged with bamboo shoot, fermented soya bean, firm bean curd, minced pork, Nonya, Nyonya, Peranakan, Pong Tauhu, pork ribs, prawn, straits chinese, taucheo, taukwa, 娘惹. I missed this soup so very much, granny was a great cook. Thanks for sharing this recipe, now I can try making them.